This afternoon Movistar Yamaha MotoGP rider Jorge Lorenzo claimed third place on the grid for tomorrow’s GP Monster Energy de Catalunya following a thrilling qualifying session that saw teammate Valentino Rossi take seventh. 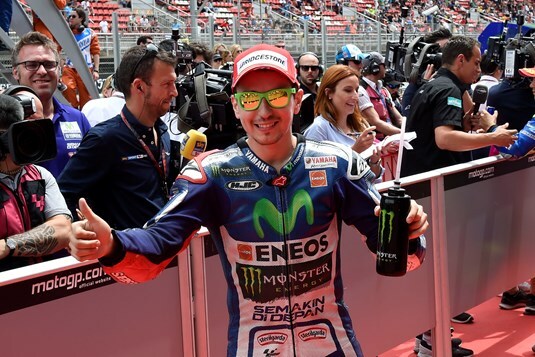 Movistar Yamaha MotoGP’s Jorge Lorenzo delighted his home fans at Circuit de Barcelona-Catalunya this afternoon by claiming a front row start for tomorrow’s GP Monster Energy de Catalunya, taking third on the grid. With all twelve riders in Q2 within a second of each other, teammate Valentino Rossi pushed hard and made his move at the last moment. He will start tomorrow’s race from seventh position, two rows behind his teammate. Eager to impress his home crowd, Lorenzo was the first to leave pit lane for the 15 minute qualifying heat. When he hit the track he shot straight to the top of the time sheets with his first flying lap of 1’41.008 and immediately returned to the pits for his first stop. With nine minutes left on the clock he came out on his second bike, ready for another time attack. Having been pushed down to third, the local hero fought back with a perfect 1’40.646 lap for provisional pole position. With a little less than four minutes on the clock he quickly headed back to the box to switch back to his first bike for a final push. Having dropped two places in the mean time, he gave it his all, but was unable to improve his time and remained third, 0.100s from pole. On a one-stop strategy, teammate Rossi left his attack to the very end of the qualifying session. Riding in the midst of the twelve riders on track, the nine-time World Champion found some clear track space. His first flying lap moved him to seventh, but he fell back two places as all the riders clocked their times. Rossi pushed hard on his second flying lap with a 1’41.257, temporarily reclaiming seventh spot before making his way back to pit lane for a fresh set of tyres with less than seven minutes of the session remaining. Two minutes later he headed out on his second stint. Unable to improve with his third flying lap, he picked up the pace in a last effort to better his starting position. The flag signaling the end of the session had already come out when Rossi was on a final clear run, delivering a 1’41.058. This moved him up from ninth to seventh, 0.512s from pole, to take the first slot on the third starting row. Monster Yamaha Tech3 Team rider Bradley Smith will start the Gran Premi Monster Energy de Catalunya from the third row on the grid after speeding to 8th place in this afternoon’s qualifying practice 2. The 24 year old rider began the day by finishing the morning FP3 session in 10th place which enabled him to progress straight through to the final 15 minute shootout. Here, Smith dropped the hammer straight away and after undertaking a total of 7 laps around the Catalunya circuit, he met the chequered flag with a strong time of 1’41.068. This time was only half a second back from the pole position lap plus, the British rider set the fastest Yamaha speed with 339.9 km/h. Tomorrow he will look to launch off the grid and battle right behind the leading factory MotoGP bikes aboard his Yamaha YZR-M1. On the other side of the Monster Yamaha Tech3 Team pit box, Pol Espargaro will begin his home Grand Prix from 11th on the grid after a tightly contested qualifying battle at Catalunya in which the top 16 riders were covered by a second. The young Spaniard commenced the day with a notable ride to 5th in the morning practice and when the all important qualifying session began in the afternoon, he leapt into action as he gunned for a top starting position in front of his home crowd. On his 6th lap he posted a time of 1’41.385 he attempted to improve further on the next lap, yet he unfortunately fell at the first corner. Nevertheless, Espargaro’s time was three tenths of a second quicker than his qualifying time from last year and when the lights go out tomorrow he will intend to climb through the pack to join the battle for the leading satellite bike position. The riders of the Athinà Forward Racing team will start tomorrow from 15th and 19th place on the grid aiming to win the Open class once again. Stefan Bradl and Loris Baz ended the qualifying session today with a personal best of 1’42.053 and 1’42.592, just half a tenth short of the head of the Open. The German battled with Barbera throughout the sessions. As his competitor took the pole of the open category a few seconds before the checkered flag, Bradl will start from the fifth row. His goal is to collect important points for the championship. Loris Baz was held back by chattering problems and will start from the the seventh row. The Frenchman is targeting the top 15 again for tomorrow.